I posted this on the parish’s liturgy facebook page yesterday. We provide resources for prayer, but as with many church things, you have to know where to look. At the very top, we have a few missalettes for people who would like the readings, either to follow along during Mass or to take home. We get about 35 large print and regular items and they mostly disappear about a month into the cycle. These two here, plus a few in the back of church. We have Shorter Christian Prayer for the Liturgy of the Hours. These get a lot of use. Christian Prayer some, but not so much. 2,000 pages are a lot to navigate, especially for the novice. But a few of our students jump deeply into the Liturgy of the Hours. I don’t know where those light blue booklets came from. They are a “stewardship rosary.” I’ve never looked at it, I admit. They appeared in the sacristy one day. You can also see the holy cards we produced that illustrate our processional crucifix. 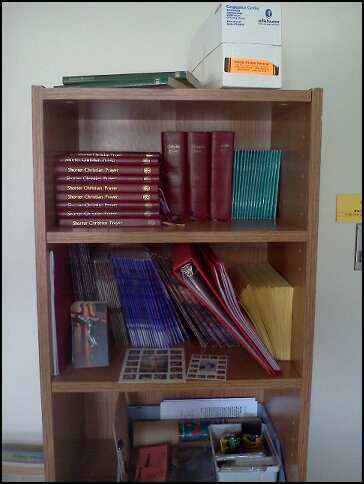 One summer’s task is reorganizing the sacristy post-Exile. What to do with toy cars, old name tags, and sign-up cards for 2011? This entry was posted in Parish Life, spirituality and tagged Liturgy of the Hours, prayer, sacristy, way of the cross. Bookmark the permalink.